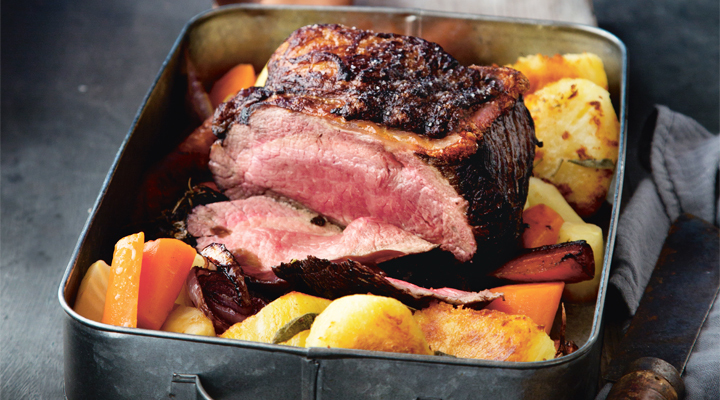 A delicious roast dinner that everyone is sure to enjoy. First break the garlic bulb into individual cloves, then lightly crush each clove with the flat edge of a knife. Put the beef in a large container with the garlic, carrots, onion and a bouquet garni made with fresh parsley, thyme and a bay leaf all tied together with kitchen string. Pour in the red wine. Cover with cling film and marinate in the fridge for at least 2 hours, or better still, overnight or up to 24 hours. Lift the beef from the marinade and pat it dry with kitchen paper to remove all the moisture. This will result in a nice bronze colour on the meat. Keep the marinade to use later. Heat the oil in a large pan set over a very high heat. Add the beef and sear on all sides, then remove from the heat and season well. Lift the vegetables from the marinade and arrange on the base of a large, deep roasting tin, setting aside the rest of the red wine marinade for later. Add the beef to the roasting tin and place in the oven. Roast the beef at a high temperature for about 15 minutes to get the heat through to the centre of the joint. Reduce the heat to 170°C/gas mark 3 and continue roasting for 12 to 13 minutes per 500g for rare, 17 to 18 minutes per 500g for medium or 22 to 24 minutes per 500g for well done. When the beef is done to your liking, remove the tin from the oven, cover it loosely with foil and allow the beef to rest for about 5 minutes. Remove the beef from the roasting tin and put the tin on the hob. Add the flour and stir until the mixture becomes dry and lumpy. Stir in the red wine marinade, then slowly add the beef stock, stirring constantly. Strain through a fine sieve into a clean saucepan and cook for 2 to 4 minutes, until thickened. Carve the beef at the last minute, divide the slices between the plates and spoon over the sauce. Serve with the roast potatoes below and your choice of vegetables.